Luxury Belfast Hotels. My favourite of the luxury Hotels in Belfast has to be the Merchant Hotel on Waring street in the Cathedral Quarter. 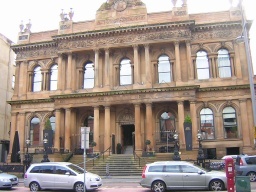 This magnificent Italian styled sandstone building was formerly the headquarters of the local Ulster Bank.It was built in 1860 in the then heart of Belfast’s commercial area. Even if you cannot afford to stay overnight,this luxury hotel is well worth visting for a leisurely drink just to admire the breathtaking ornate interior ceiling in the interior grand hall dining room. If you fancy living like a big rock star then the luxury Merchant Hotel in Belfast is made for you – they can even arrange for their ‘Bentley’ to collect you from the airport! There are 26 rooms and five exclusive suites, all with the latest amenities including huge flat screen TVs and cavenous bathrooms.The Seamus Heaney suite,named after the famous poet and writer has perhaps the best views of Belfast and a lovely four poster bed. 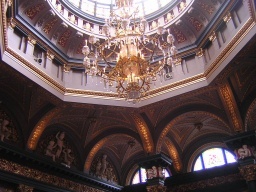 So if you happen to be in Belfast’s Waring Street why not pass through the front doors of the Merchant Hotel, and be treated like a Hollywood celebrity as you enter (even if it is just to glance up at that ornate ceiling!). Have you stayed in the Merchant Hotel or do you have another favourite luxury hotel in Belfast or Northern Ireland ,let us know via about us page below. Looking for budget hotels in Belfast follow this link.